Mr Spider enjoying the early morning sun blissfully unaware that in just a few short hours he'll be involved in a TWELVE SPIDER PILEUP. Oh, the huge manatee! My umbrella looks like a twelve spider pileup. Instead of the glorious press-sliiiiide-sproingggg action that it used to do when I deployed it, I now get a urrggghhh, griiiiind, thuhhhhd followed by the sprinkling and tinkling sound of little bits of metal falling to the ground. I love my umbrella. Not in a munching my way through a chocolate bra sort of way, but in a fifteen years of sterling service sort of way. Amazingly, for someone who barely remembers to leave the house dressed in the morning, I have managed to not lose this awesome device. It has travelled to many countries, it has been carried to London and back twice a week for half a year and despite my ability to go to the shops for some bog rolls and instead come back with a bottle of wine, some chocolates and a trifle, Mr Umbrella is still in my possession. The dictionary should define miracle as “Cobra’s umbrella still being with him”. It has protected me from the rain and has sprung to service at the press of a button. You don’t just throw away an umbrella like this, you nurse it through its final days and then, finally, when it is unable to unfurl its beautiful protecting structure it gets a burial and a suitable speech. Mrs Cobras, of course, would slip it into the bin when I wasn’t looking if she saw just how much work is now involved to get the thing into a position where it is able to protect me from the British weather. It now involves a press, a manoeuvring of several bits of metal, holding one bit with one hand and springing it back whilst detangling some of the skeleton and then a brute force shove to deploy the two thirds or so that actually open. This requires three hands and the last time I counted I had one fully usable one and one that still aches after a bus tried to run me over the other week. I’m pretty sure that when we finally move, despite 2010’s extensive clean-out, it will be a voyage of discovery and embarrassment one way or the other. However, I am pretty sure that all the old “magazines” were safely carted away to the tip. This entry was posted in Miscellaneous rubbish and tagged cobra art, spider, umbrella. Bookmark the permalink. 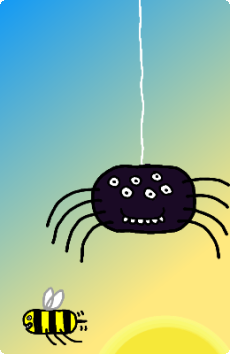 My three year old nephew was most taken by the picture of the spider on my iPhone, so much so that he got bored with the game he was playing in order to play with the spider. still aches after a bus tried to run me over the other week. Missed opportunity for great blog post No. 1. I sympathise with the hoarding aspect. I used to carry all manner of stuff around with me as I moved from apartment to apartment. In the end I got fed up with it and had a massive clear out, amassing 19 full refuse sacks of rubbish, which was quite a feat given that I am single and live in a one bedroom apartment. I found I had been carting 7 yellow pages around with me spanning about a decade even though I never used any of them; I would simply add the latest to a random bag or box then cart it around after me. At first it was quite painful to throw stuff away but as I got into my stride it very much felt like I had started walking gingerly down a hill, got a bit more confident so started to jog down and towards the end almost lost control as gravity took over and propelled me to the bottom almost as fast as my 36 inch inside leg measurements would carry me! I threw away so many transformer comics from the UK only to then have a mate tell me they could have been worth something. Oh well, c’est la vie. The only comic I kept was an original star wars comic from 1977. Glad the spider was so popular. He’s a groovy spider! I share the horror of throwing stuff away only to discover it was worth a fortune. I’ve used the “it’ll be worth something someday” excuse far, far too many times!